A cute, vibrant Valentine`s Day gift for a cute, vibrant personality! Our fun gift box of multi-coloured rainbow roses for your Valentine sweetheart (if only we could include pots of gold!) this features 18 roses in a mix of bright coloured pink, orange and yellow. 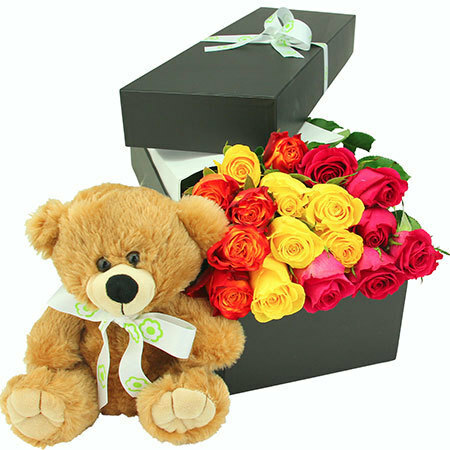 Teamed with a cuddly teddy bear for an extra sweet touch, this non-traditional style Valentine`s Day gift box and teddy bear is sure to bring a few cuddles in your direction too! Our signature presentation box filled with fresh, long stem bright roses is designed for maximum wow factor on arrival. And to ensure our rainbow inspired roses stay as fresh as possible in transit, we individually pack each one into its own water pouch. 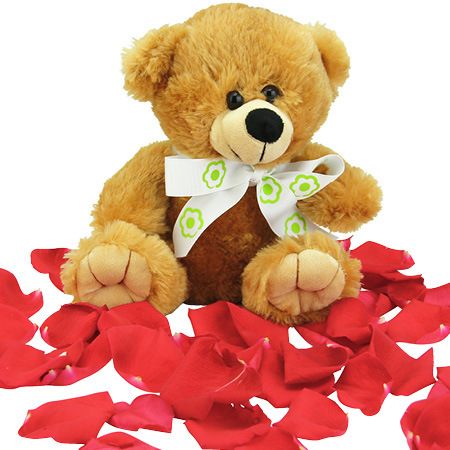 Order your teddy bear with bright roses for Valentine`s Day online now for delivery Thursday 14th February! 2019-02-20 Service rating : Flowers didn`t get delivered on valentines day. Arrived a day late with no compensation or discount. Second time ordering with Flowers For Everyone, very disappointing. Will not be ordering with them again. Product : Flowers didn`t get delivered on valentines day. Arrived a day late with no compensation or discount. Second time ordering with Flowers For Everyone, very disappointing. Will not be ordering with them again.